NBA – The Cleveland Cavaliers host the visiting Toronto Raptors for their final match of the regular season at Quickens Loans Arena in Cleveland, Ohio. It’s the 3rd and final meeting of these two team’s where one team is trying to break the season tie at 1 win and 1 loss. The Raptors won the first meeting at Air Canada Centre in Toronto, Ontario while the Cavs won the 2nd meeting in Cleveland. Prior to the game, The Raptors are currently the top seeded team in the East with 55 wins and 21 losses, while the Cavaliers are the 3rd best team in the East with 47 wins and 30 losses. Both teams are already bagged a playoff spot and just trying to solidify their current position in the East Standings with only few games left before the post seasons begins. A loss in tonight’s game either of these two teams will in danger their current position in the East Standings. The #1 seed Toronto Raptors is trying to keep away the #2 seed Boston Celtics while the Cavaliers is also keeping away the hottest team in the league with 10 – game winning streak the Philadelphia 76ers at 4th spot. In the game, the 1st quarter was a back and port quarter not until the Cavaliers was able to take a lead in the later minutes to end the opening quarter leading by 4 points 28 - 24. LeBron James and Jose Calderon lead the Cavaliers after scoring 10 points and 11 points respectively. Calderon shows a great start after making 5 out of 5 field goals in the opening quarter. In the 2nd quarter, Cavs starts to dominate the East best record after posting the first double lead of digit of the game and even further their lead to 16 points. Kevin Love exploded for 12 points in the quarter after hitting several 3’s, but the Raptors able to cut the Cavs lead into single digit after having a late run in the quarter, At the half Cavs up by 8 points 60 – 52. 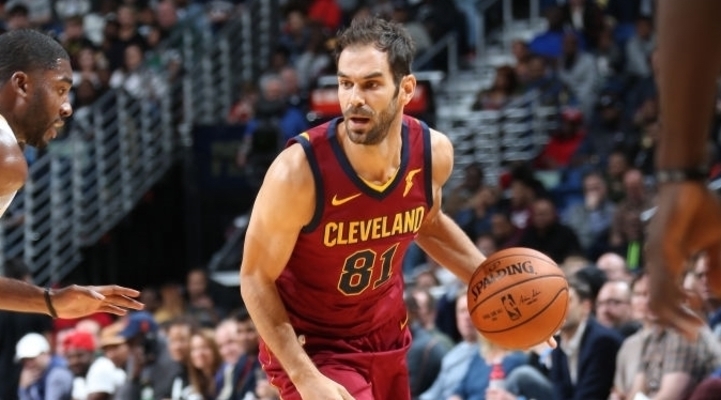 Surprisingly Cavs point guard Jose Calderon leads all scorers at the half with 14 points while Ibaka and Valanciunas scored 10 points each to lead the Raptors. In the 3rd quarter, the Cavaliers are enjoying a double digit lead for almost the entire quarter not until DeMar Derozan made a 3 point play to cut the Cavs lead back at 8 points both teams scored the quarter 26 all to end the quarter 86 – 78 Cavs up by 8 points. In the early minutes of the 4th quarter, The Raptors quickly cut the Cavaliers lead into 5 points but the Cavaliers quickly regain their composures and back their lead to double digit lead and looks much in control of the game not until the final seconds of the game where the bench player of Raptors outscored the bench players of Cavs that cut the Cavs leads into 4 point the closest the Raptors came since the 2nd half with 11.1 seconds to go. The Cavs manage to win the game 112 – 116 to take a 2 – 1 series match against the Raptors. Meanwhile Jose Calderon scored his season high of 19 points and LeBron James leads all scorers with 27 points, 10 rebounds and 6 assist. No Comment to " Jose Calderon Scored Season High to Help Cavs Passed the Raptors "